It's really about time: The Droids have been a pretty successful line of Android phones, and finally someone is making the obvious connection to the Star Wars robots that bear the same name. Motorola says an R2-D2 version of the brand-new Droid 2 is coming in the fall. In honor of the iconic Astromech Droid from the Star Wars Saga, Verizon Wireless will offer a limited-edition R2-D2 version of the DROID 2, available only online in September. The special version of the phone will feature exclusive Star Wars content and external hardware designed to look like the trusty Droid from the film saga. Nice! Presumably, the regular mechanically intoned "DROID" the phone announces at startup will be replaced by R2-D2's distinctive beeps. Motorola will first show the droided-up Droid at Star Wars Celebration V later this week at Orlando. On the phone iteself: The Droid 2 is similar to the original Droid, with a slide-out QWERTY keyboard, making it distinct from the touchscreen-only Droid X. The keyboard is said to be all-new, though, so hopefully it's an improvement on the relatively flat keys of the first Droid. Among the other upgrades: a better processor, Android 2.2 (Froyo) and support for Adobe Flash 10.1. Perhaps best of all is its ability to share the phone's 3G connection with Wi-Fi devices. The hotspot ability works for five separate devices, though you'll have to pay an extra $20 a month for the privelege. It comes with 8GB of internal storage as well as an 8GB microSD card (upgradable to 32GB). 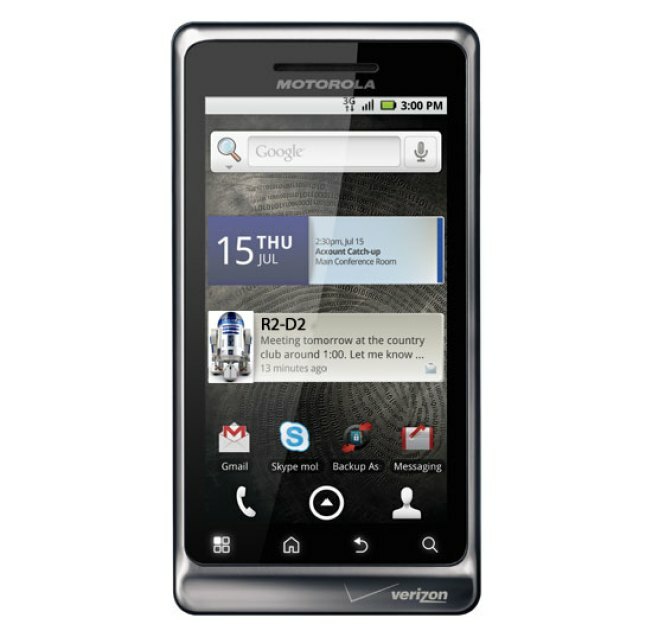 You can snap up a Droid 2 tomorrow for $199 (with a two-year contract and $100 mail-in rebate). No word on how much the R2-D2 version will cost.